Discussion in 'People' started by cwilt, Mar 27, 2007. She looks like a winner already. She indeed is very serious and you have captured the moment well, Charles. Very nice! Yeah, wait till you get that look at 14! 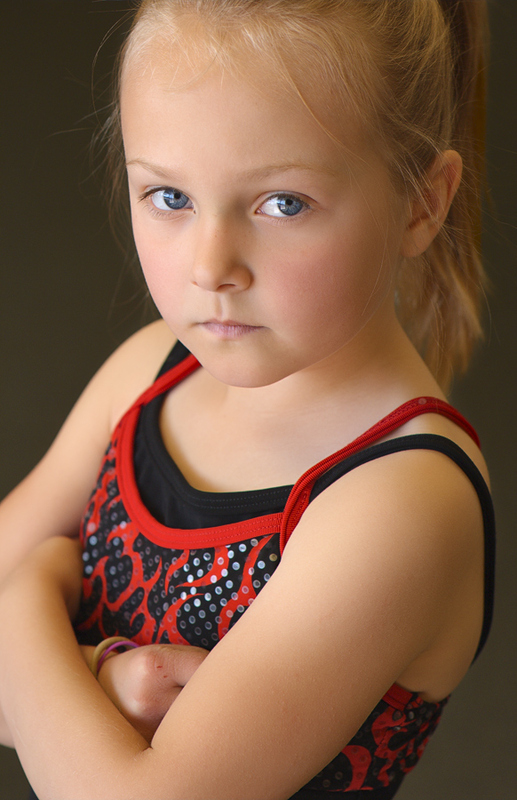 Absolutely beautiful portrait of a very determined little lady. The "eyes" have it! Thanks everyone. :smile: Feels good to be posting in the portrait area again. As the title says, she is serious about her gymnastics and does very well. Its not unusual to see her practicing her flips in the family room. Great capture, you sure she is serious about gymnastic or is she just saying with those eyes,""Sigh" Not yet another picture...?" he he he just ribbing you. Excellent pose, crisp clear blue eyes. I love the lighting! Is that a big window? What about the nice soft rear fill? What did you use front and back? This was shot at our store. A long row of windows in front with standard office tubes overhead for fill. It was cloudy so there was no direct sun light coming through. Very mixed lighting but it works. Great capture! Your best shot of her yet. I love the attitude. One of your best I've seen Charles........... simple as that! She is serious about everything. I am to blame for that. Thanks Paul. I am in no hurry to see her teen years.